In this intensely divisive election season, Bhaumik and curator Michele Carlson produce a potent and nuanced response to our current social, political, and economic realities. A wall built of hand-crafted piñatas in the form of cinder blocks will dominate and divide the Southern Exposure gallery. Over the course of the exhibition, the wall will undergo a dramatic transformation that enacts the dynamic transactional nature of border sites. The opening reception on September 9 marks the completion of the wall’s construction with a Migration Mixtape by La Pelanga DJ collective, street food, and limited edition mini-piñatas by the Little Piñata Maker. Several days later, under cover of night, Cece Carpio of the collective Trust Your Struggle will intervene to tag and deface the wall. 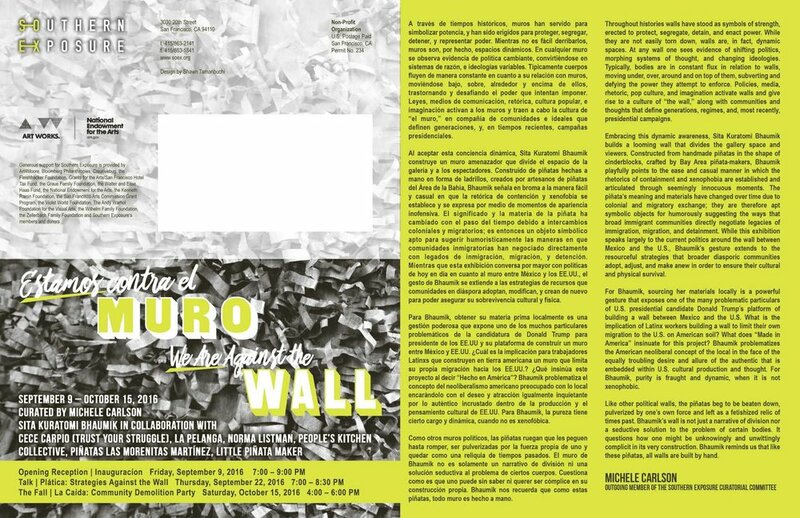 On September 22, the wall will serve as the literal backdrop for a public dialogue with artists and organizers working around the subject of migration. Finally, at the closing reception on October 15, we will all come together to pummel the piñatas – celebrating the destruction of the wall with a blow-by-blow narration by People’s Kitchen Collective, music by La Pelanga, and food to fuel our border crossings. The opening reception on September 9 marks the completion of the wall’s construction with a Migration Mixtape by La Pelanga DJ collective, street food, and limited edition mini-piñatas by the Little Piñata Maker. Several days later, under cover of night, Cece Carpio of the collective Trust Your Struggle will intervene to tag and deface the wall. On September 22, the wall will serve as the literal backdrop for a public dialogue with artists and organizers working around the subject of migration. Finally, at the closing reception on October 15, we will all come together to pummel the piñatas – celebrating the destruction of the wall with a blow-by-blow narration by People’s Kitchen Collective, music by La Pelanga, and food to fuel our border crossings.